It Was a Manic Monday , Yesterday ! I love Mondays because they are challenging . It’s the start of the office week , so some works have piled up over the weekend . But somehow I always manage to sneak in here , despite it being busy . Such was not true yesterday , because at the start of the day , we had our emergency meeting which took a long time . After which , I have to type the minutes of the meeting and the memos that my boss wants to be disseminated within the day . Added to that , I have to audit reports and deposit slips and the like , that has deadlines for each day , they come . Whew ! At the end of the day about 30 minutes before dismissal , all I did was sit and sniff my white flower , because my head ached . I was able to peep in here for a few minutes , while I was already resting at home . I saw the comment of @soffssu asking why I wasn’t here the past days . How sweet of her . The picture depicts the very sunny day here today . Good day everyone ! Indeed . The adrenaline rush is so much at work on Mondays . SO, how was your Monday too , yesterday ? We;; the whole week i was also super busy. Yesterday I was in the PC office and remitting my due dates. That' s understandable , my friend because you are a businessman . I am happy for you because it means your business is picking up. @SIMPLYD Yes, in fact, the manager of the PC wanted me to have the 35k credit line but I begged off because that is a huge amount. @Yar_Joey At least you have a ready credit line if ever there is a need for an additional capital . That's a beautiful snap! The beautiful lady,draped in a wisp of white fluffy clouds, looks really enchanting in the background. (I am sorry but I think I just got obsessed with that volcano!) I think you are right to feel perk up (even though most people suffer from Monday-blues) owing to the excellent weather you have there. So you too got obessessed with our Mayon volcano. Specially on a bright sunny day like this , she is so majestic. Yes, it never fails to perk me up each morning i went up the stairs to the second floor. So, how's your Monday too, my dear.? @SIMPLYD As I am typing my response to your question, I can see Monday, all worn out and exhausted, wearily picking up her skirt and dragging her feet towards the final hour of her existence. After a mere forty minutes, a new day will come, clad in a fresh skirt and frills and shall walk alongside me. As for the departing one- she was cheerful and lazy all day long. What about yours? @The_Bong_Woman I guess all of us had a busy Monday , as it always is specially to those who works full time . By the way , are you working full time too ? My Tuesday wasn't as busy as Monday . I feel lethargic though . that's a gorgeous photo of the Mayon . With that view from your office , no wonder why you are full of energy doing all that work and at the same time visit mylot .. Indeed it was so gorgeous as i climb the second floor , i have to take this picture . Actually , when the work becomes monotonous , myLot is my breather , as well as going out to the seadeck view to gaze at Mayon and the sea even for a minute or two . @SIMPLYD You are so lucky to have that view everyday .. I wanted to buy a property there in Legazpi, but my sons told me I'm just wasting my money because none of them would want to go back there often like I do..
@epiffanie Well , if yoou and your husband plans to retire here , hen why not . But if not , it is indeed impractical . You can just stay at your parents house whenever you are on a vacation here . Oh you poor thing.. I hope today is a better day for you. Hope to see you her sometime during the day. Yes, today is better . As you see , i can already peep in here once in a while. @SIMPLYD You sound relaxed and yes, you have been here That is good. Enjoy the rest of your day! @sofssu You too , my friend . indeed , the white flower is so needed that's why the night before i prepare my bag , i really see to it that the White flower is there . Just sniffing it after a busy day is enought to relax me . How's your Monday mu friend? 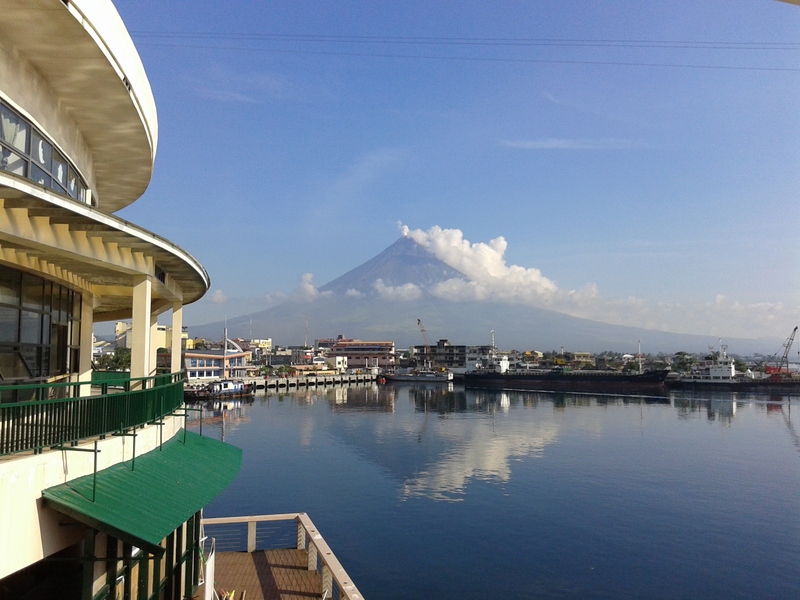 By the way , did yo like the picture of Mayon by our office place , i took today? @jaboUK That's good to know . I must admit i was able to capture this majestic view even with just my cellphone . The sea water really reflected it and made the picture look more splendid. It seems your Tuesday is pretty relax :) Hope tomorrow will be better. po. I expect tomorrow to be a busy one again . I already know the flow of work . Anyway , i already know how to cope up with busy days . What bout you , how are you in your work today ? @wiLLmaH You are also busy indeed . But it's good to be busy , because we experience having the adrenaline rush . Yes , we should be happy that at least we have work . I hope Tuesday isn't as manic as yesterday. It isn't anymore . But comes Wednesday and Thursday it will be again . @SIMPLYD Still you have poise and grace. @sol_cee I have to. I am in an office that's why . That's quite a lot of things to do. It's good you managed to do all of those! I hope today is not as busy as yesterday. It's a challenging day and i like the adrenaline rush . Though , i had a headache after that . But i am ready for that headache -with my white flower . Yes, today is manageable so i am able to peep in here once in a while . @SIMPLYD nice that you always have that white flower. I also keep it in my bag's pocket, just in case I need it. @brokenbee I seem an addict for it . I sniff it when i feel like it . Just another manic Monday, wished it was Sunday! I just feel like singing that song! Yes, i remember that song too . So, how are you today ? @SIMPLYD Still busy but everything's under control. @toniganzon Me , it's not anymore as you can see i can now peep in here once in a while . Thank you . I enjoyed my Monday since i was. challenged to excel despite the pressure. Today, Tuesday was not so busy anymore . At least i was able to peek in here whenever i have done an assigned task. What about your Monday and Tuesday too? @SIMPLYD yeah going as per routine. Hopefully things go fine for now. what a gorgeous view! i could sit fer hours'n jest marvel't such beauty. sad to hear ya'd a rough day, but happy to see that'cher back to yer jolly self :D big hugs! Thank you.. This view is one of those that perks me up in the morning when i climb the stairs going to the second floor and when dismissal comes or at anytime , i feel like it . Some days there is nothing we can do to get time for ourselves. I'm glad you had some white flower to help with your headache and make you relax. Yes, we have those kind of days . But somehow we manage them well and bounce back the next day after having a full sleep. The white flower is already my companion at all times . Always ready to help me . Good to see you here today. Hope you are rested now. And the picture of the volcano. I am also glad to be able to come here and see you also , my friend . Your hands were full! But good thing everything turned out well. Yes, and i always expect that on a Monday. The thought that it will be a busy da excites me . I take t always as a challenge. I always pray fervently specially on a Monday , for God to give me the wisdom, strength and calmness to do my job well. And that i think it is what really helps me to go through it smoohly . Well mondays is sure a busy day. It is understandable to be that way , because there were two non-working days so works piles up. You sure are busy on Mondays. Good luck to you getting everything done. Well, i always expect Mondays to be like that . I am happy i have done them all during the day . I don't want leaving works undone for the next day . I just came also after some days of being away. How are you now? I hope you are fine. Actually , i was fine already after i have sniffed my white flower while i rested at the end of the day , before dismissal . I like it when i am as busy like that . It gives me adrenaline rush and i feel so alive when i have that . @SIMPLYD Good to know you are now fine. @salonga I will always be , as long as i have my whte flower with me always. It is usually busy on Mondays for me as well, so you are not alone here. Sometimes it is a bit daunting to get into the working mode especially after an eventful weekend. So it's gonna take a while. Believe it or not, i always prepare for Mondays. It seems i am so excited to know what lies ahead and how challenging it will be. At the end of the day when i reflect on how i was able to do them all, makes me feel proud of myself. I love the adrenaline rush actually . @SIMPLYD I like your positive attitude and much more your self motivation here. I have a few members in my department which I really need to sit down with at the beginning of the week to get them to pick up the attitude and in turn the pace. After that I will go with the "A" team to pick myself up so as you can see my work place can be quite a battlefield here. But, I suppose that's what you would call it as challenge. @artemeis IT's hard when you have to motivate the staff . But with ourselves only it is easier for me . Sounds like a very busy day for you. I think the emergency meeting, and all the work that come out of it really can make you and your colleagues stress. Hope that all other days are not so busy. I always expect Mondays as busy . So , i am used to it actually . Yes, the next days wasn't that much busy anymore .